Canberra Raiders coach Ricky Stuart has got the Raiders off to the perfect start. File Photo. There was a lot to love about the Canberra Raiders 21-0 win over the Gold Coast Titans to kick off their 2019 campaign, from the way Aidan Sezer controlled the game to Josh Papalii’s impact in the middle and ability to pick up the ball cleanly when everyone else was handling it like a bar of soap. Here are the five things I loved most about the Raiders’ round one win. You have got to love John Bateman. On his NRL debut, the English back-rower was bouncing out of tackles, sidestepping would-be tacklers, making 19 runs for 145 run metres, tackling 36 times while busting through tackles five times. It was the definition of an impressive debut for his new side, with his versatility, strong runs and tough defence, not to mention his cheekiness. My personal highlight was when he faked throwing a ball at a Titans player and then laughed at them for flinching. It’s the start of a love affair for Raiders’ fans though you get the feeling that every other team’s fans will hate him by the end of the season. Jack Wighton said during the preseason that his kicking game would be his only concern moving into the halves, but all fears about his lack of kicking ability can be put aside. Along with his partner Sezer and Josh Hodgson, Wighton’s kicking game put the Raiders on the attack time and time again. Despite his shaky start which saw his kick-in behind go dead, his booming left boot led to a goal-line dropout which helped the Raiders open the scoring. Maybe what was more impressive was his chase off his own kicks. Halfback Aidan Sezer’s boot was also impressive, which included a pinpoint kick across the field for Bailey Simonsson’s try on debut and great game management skills when he kicked a drop goal to ensure the two points were safe. 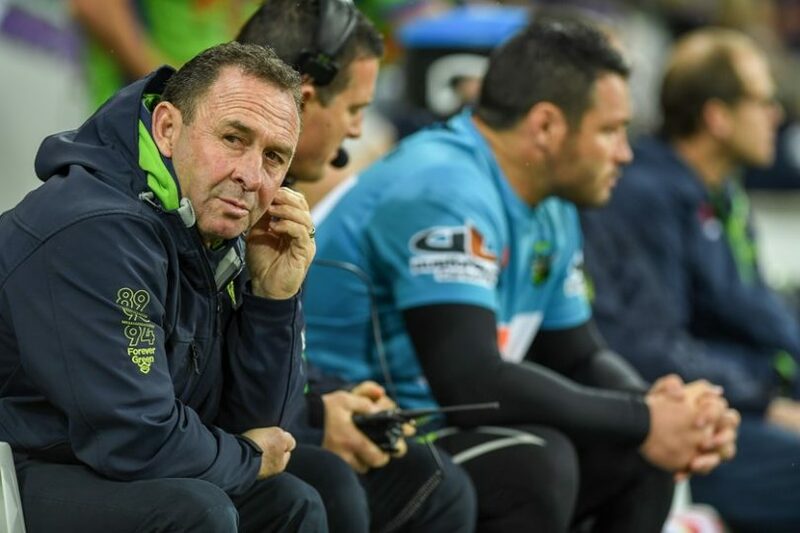 When the TV cameras panned to Ricky Stuart sitting on the sideline in the monsoon conditions, instead of sitting in the dry cosy coaches box, it spoke volumes about his character. His commitment to the team is second to none, showing his willingness to be in the same conditions as his troops. Having spent the pre-season focusing on defence, the early signs are good with the side keeping the Titans scoreless. Yes, the Titans were without Ash Taylor and they lost five-eighth Tyrone Roberts to an injury early in the game, but you couldn’t fault the Raiders’ defence on their own line. The last time the Raiders kept a clean sheet was in 2013, with a 14-0 win over the Parramatta Eels in round 19 six years ago. Stuart was measured in his response to his side’s defence and said the real benchmark will be on Friday night against the Melbourne Storm at GIO Stadium. But the early signs are good, you have to admit. The Raiders’ five debutants all shined in the pouring rain with Simonsson, Sutton and Bateman looking at home in the lime green, while prop Corey Horsburgh provided an impact off the bench and Charnze Nicoll-Klokstad overcame a shaky start and grew in confidence as the game rolled on. The wet conditions were a nightmare to handle and despite a few handling errors, Horsburgh’s defence was outstanding, Nicoll-Klokstad positioned himself well to provide defensive cover and Simonsson became the first Raider to bag a try in his first game for the club since Drury Low in 2010. The future is looking bright for the Green Machine. Great first up win for the Raiders. They will have to lift for the Storm this weekend, but they can do it.